A Parliamentary Resolution to end the Captive Breeding of Lions in South Africa has been ignored by the Department of Environmental Affairs (DEA), who proposed that the Captive Lion Breeding (CLB) industry should continue as long as it is properly regulated and appropriate legislation is introduced. This happened at a briefing meeting of the Portfolio Committee of Environmental Affairs (PCEA) on the implementation of the Committee’s Report in respect of CLB held on 12th March. This ignores the PCEA Report from a two-day Parliamentary Colloquium on CLB in August 2018, which included the Resolution specifying that “DEA should as a matter of urgency initiate a policy and legislative review of CLB for hunting and lion bone trade with a view of putting an end to this practice”. This resolution was subsequently adopted by parliament making it a Parliamentary Resolution. Merely proposing to regulate an industry that a Parliamentary Resolution required to be closed, is a shocking reversal by DEA. It also ignores the overwhelming condemnation of the industry during the August Colloquium, expressed by a wide range of local and international conservation and welfare experts, and forcefully endorsed in the PCEA report. Philemon Mapulane (Chair PCEA) stated during the Colloquium that “South Africa is allowing a practice that everybody is turning their backs to, we need to find a solution as a country to improve the situation”. The global movement to put an end to the CLB industry is intensifying with the USA, France, the Netherlands and Australia banning the importation of all captive bred lion trophies, 45 airlines placing embargoes on the transport of Big Five trophies, and major international hunting associations like Safari Club International no longer supporting the CLB industry. Mark Jones (Head of Policy – Born Free Foundation UK), who was invited to present at the Colloquium, said “this hugely disappointing decision by DEA reflects just how deeply the South African government is in the pockets of those who exploit its wild animals for profit”. During the PCEA meeting earlier this month, DEA reported that of the 227 breeding facilities inspected in the Free State, Limpopo, North West and Eastern Cape, nearly 40% (88 facilities) were non-compliant with among others the Threatened or Protected Species (TOPS) Regulations. Many facilities were also found to be operating with expired permits with the vast majority being reissued without penalties or providing reasons for renewal. Blood Lions, a leading organisation that works to end the captive lion breeding, canned hunting and lion bone trade industries in South Africa, is deeply concerned by the outcome of the recent briefing. “DEA’s recommendation to regulate an industry, which has been thriving for over 20 years already under so called ‘governance’, is proof of ineffective legislation and poor regulation”. The Committee appeared unconcerned that these activities are taking place without or with inadequate regulation and that DEA inspections are only TOPS compliance checks carried out in conjunction with provincial authorities. With only four inspectors to cover the entire country, DEA admitted to be underresourced, while at the same time their inspectors are not tasked to undertake welfare inspections. 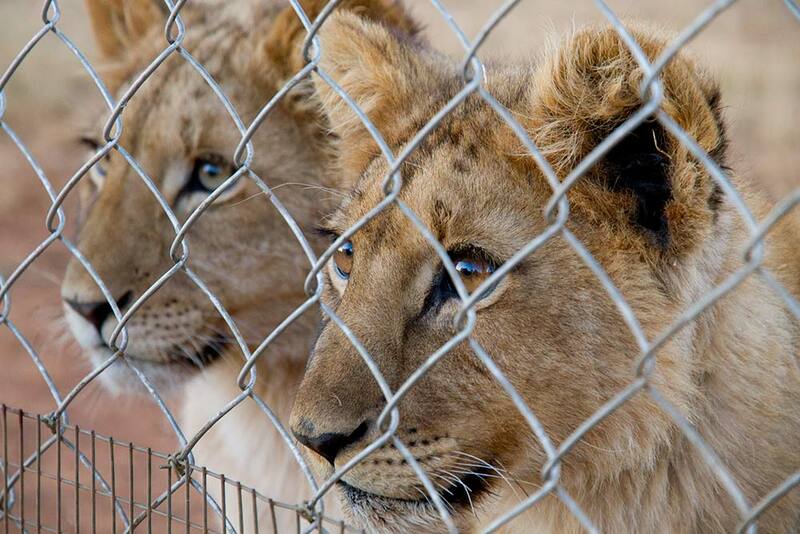 The NSPCA lodged a court application challenging DEA’s “quota system” on the lion bone trade on the basis of among others, welfare concerns and the prevalence of poor standards and practices in CLB facilities. DEA issued a media statement last week that created confusion over the state of this court case. Karen Trendler (Manager Wildlife Trade and Trafficking – NSPCA) however made it very clear that “the NSPCA has not dropped the court case against DEA”. Trendler confirmed that the NSPCA, as the sole organisation mandated to carry out welfare inspections, are “negotiating with DEA to make sure welfare issues in the CLB industry and welfare of all captive wild animal species are properly addressed and that their inspectors are granted access to all lion breeding facilities across the country”. DEA has previously either been unable or unwilling to provide both the NSPCA and PCEA with a list of such facilities. Minister Mokonyane stated in this press release that they are looking to complete “a variety of protocols on the captive-breeding, welfare norms and standards, governing the keeping of lions and associated trade practices”, making it cristal clear that DEA has no intention of putting an end to this practice. The Minister further states, they need to ensure that “…ultimately South Africa prevents non-compliance with globally acceptable standards and norms in the captive-breeding of lions…”. Yet, there are no global norms and standards for CLB and worldwide there is unanimity that this abhorrent industry needs to be closed down. Notwithstanding the consensus of the Committee Report towards ending this cruel and unethical industry, Mapulane defended DEA’s decision on social media as positive by stating “on the contrary, the Minister has advertised the appointment of High Level Panel [HLP] to review this practice”. On 25 February 2019, the Minister indeed announced the formation of a HLP of experts “to review policy positions, regulatory measures and practices on aspects of conservation that are directly and indirectly related to hunting, trade, captive keeping, handling of iconic species of elephants, rhinoceros, lion and leopard”.From this description and that on credentials of potential HLP candidates, “…must be persons …committed to and subscribe to the objectives and principles of conservation and sustainable use…”, it seems that sustainable wildlife ultilisation remains a priority fixture on the agenda of DEA with very little chance of seeing the CLB industry reaching its sell by date.